This soup is not only flavourful and amazingly comforting on a freezing cold days. 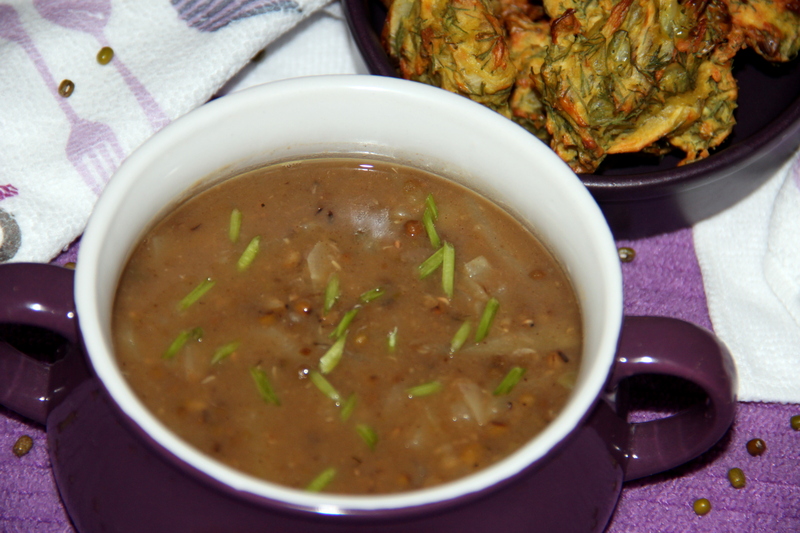 Its packed with health boosting ingredients like lentils, cabbage and the spices adds flavour to the soup. Lentils are a healthy and versatile food. They are also inexpensive, making them a great staple for anyone interested in healthy, frugal living. They are probably the fastest cooking of all the legume family, and they don’t require much soaking. Rich in antioxidants, which boosts the immune system. They are also packed with protein, high in iron and folate and very high in fiber, which is good for your digestive and heart health. Steaming your cabbage offers health benefits over other types of cooking, such as boiling, because it minimizes nutrient loss during the cooking process. Consuming steamed cabbage boosts your intake of vitamin C and K.
Wash Green mung thoroughly and soak for an hour with enough water. with soaked water and cook until soft. Once cooked drain and reserve the water and set aside. In another large out, heat oil over medium heat. Add onions, cook and stir until onion is tender. Stir in garlic, bay leaf, cinnamon, clove and cook for 1-2minutes. Add stock. Steamed cabbage, chilli powder and bring it to boil. Add in cooked lentils reduce the heat and simmer for 18-20minutes. Season with salt, pepper and serve hot . Lentils can be cooked even without pre-soaking but might take some extra time to cook. Chopping cabbage to small chunks helps to steam faster. Spices can be altered as per the taste. Green chilli can be used for an added hotness or can be customised as per choice. Posted on November 13, 2014, in International, Soups, Salad and Wraps. Bookmark the permalink. 10 Comments. This looks very good! I make a lentil soup with cinnamon, but I love the addition of cabbage in this – it’s one of my favorite vegetables because it’s healhty & cheap! I just saw my first snowflake of the season so it is only fitting to want to dive into a bowl of hot soup! The garlic, cinnamon and chili powder will help fight off the chill as well. Thank you for this Chitra.